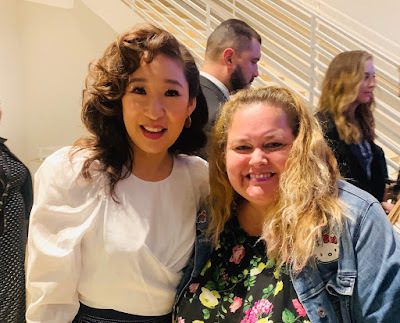 Over the years I've had several encounters with Sandra Oh. During the first one (at a movie theater), she said thank you, but she didn't do pictures. On the second one, she did pictures happily (this was at a talk show). This third time, she was making the rounds and taking pictures with everyone who lined up. She would shake your hand, ask you your name, and made small talk. Very cool! She's incredible on Killing Eve, but I'll forever miss her as Dr. Cristina Yang on Grey's Anatomy.